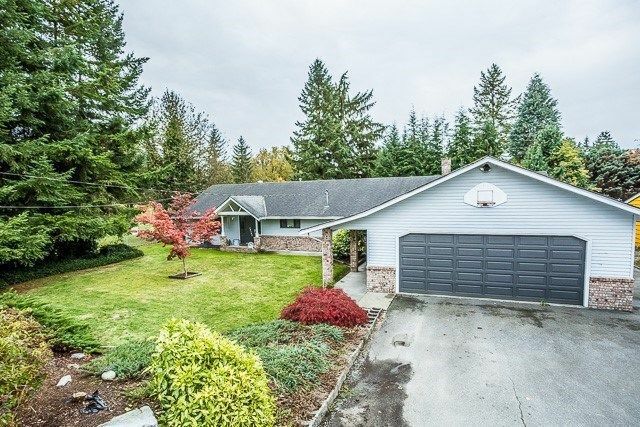 LOVELY 4 bedroom RANCHER with separate living quarters. 3.5 bathrooms. Huge cozy family room with wood burning fireplace. Roof is approx. 11 years old. Furnace replaced 4.5 years ago. Hot water tank is 2 years old. Gorgeous unobstructed VIEW of Maple Ridge Golf Course. Lot is 17,875 sq ft with 98' frontage. Development Potential. 2 DOUBLE GARAGES. 1 ATTACHED TO THE HOUSE and another SEPARATE DOUBLE GARAGE WITH LANE ACCESS. HUGE DRIVEWAY WITH R.V. PARKING. GREAT WEST SIDE OPPORTUNITY HERE. WALKING DISTANCE TO THE WEST COAST EXPRESS. QUICK, EASY ACCESS TO the Golden Ears Bridge & only 45 minutes to Downtown Vancouver.